Toko Jual GPS Garmin Fishfinder 400c Murah di Denpasar, Bali. 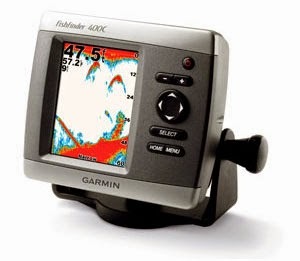 The versatile Fishfinder 400C has a super bright, high resolution 4-inch display and is great for finding fish in both freshwater and saltwater. The 400C is available with a choice of dual beam or dual frequency transducers, so itâ€™s readily adaptable for both freshwater and saltwater fishing. The 400 watt (RMS) dual beam version offers a wide fish-finding cone and reaches depths of 900 feet. With the 500 watt (RMS) dual frequency transducer, you can reach a depth of 1,500 feet. Fishfinder 400C features a crisp, ultra-bright 4â€ QVGA color display, plus UltraScrollâ„¢ for screen updates at live-action speeds. It's also CANet-compatible, so you can share sonar information with plotters located elsewhere in your boat.